This collection is different from a lot of my pieces in that it uses only simple tent stitch all over. 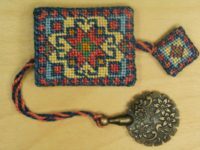 The design is based on a lovely old oriental carpet and is similar to the Turkish Tassel Bag and Doorstop. 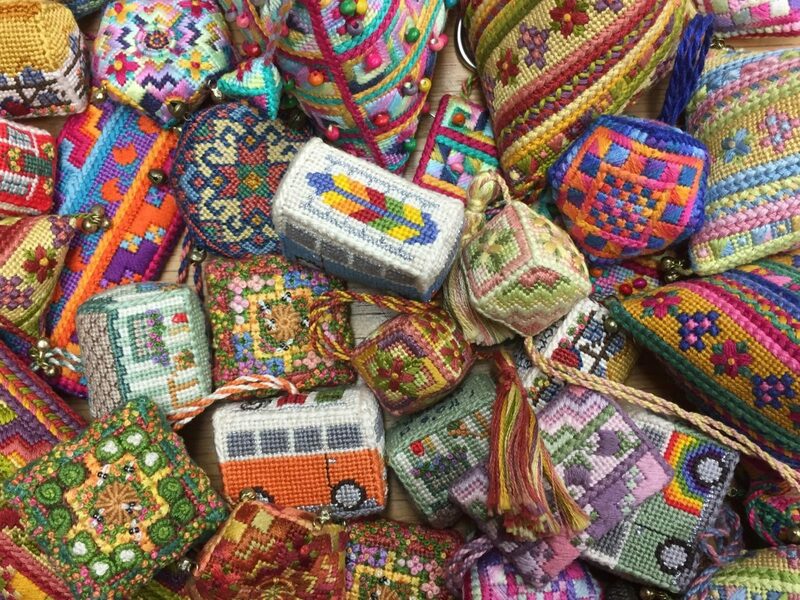 These lovely old ethnic textiles designs have always been a favourite for me. All the stitching is worked in stranded cotton using four strands of one colour and two of another, this give a slightly muted effect rather like an oriental carpet. The little felt lined pockets keep your embroidery scissors or thread cutter safe. Take the scissors or thread cutter out to use them and then use the tagged twisted cord to pull them back inside the pocket. The Spectacle case is worked on both sides and is lined in felt with a magnetic closure with instructions for fitting it. 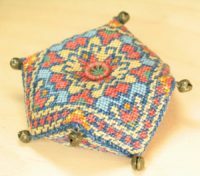 The Biscornu pincushion has a bell on each point and a Dorset button in the centre of each side. The kits contain everything you need except for some filling for the Scissor Keeper and Pincushion. Worked from a chart in stranded cotton on size 18 canvas. 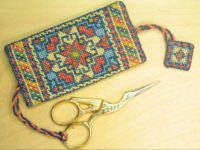 View basket “Magic Carpet Scissor Pocket” has been added to your basket.